Hōei (宝永) was a Japanese era name (年号,, nengō,, lit. "year name") after Genroku and before Shōtoku. This period started in March 1704 and ended in April 1711. During this time, the emperors were Higashiyama-tennō (東山天皇) and Nakamikado-tennō (中御門天皇). 11 November 1707 (Hōei 4, 14th day of the 10th month): 1707 Hōei earthquake, also called the "Great Hōei Earthquake". 16 December 1707 (Hōei 4, 23nd day of the 11th month): After the eruption of Mount Fuji, cinders and ash fell like rain in Izu, Kai, Sagami, and Musashi. 1708 (Hōei 5): The shogunate introduces new copper coins into circulation; and each coin is marked with the Hōei nengō name (Hōei Tsubo). 28 April 1708 (Hōei 5, 8th day of the 3rd month): There was a great fire in Heian-kyō. 19 February 1709 (Hōei 6, 10th day of the 1st month): Shogun Tokugawa Tsunayoshi died. 1709 (Hōei 6, 4th month): Tokugawa Ienobu became the head of the Tokugawa shogunate. 7 August 1709 (Hōei 6, 2nd day of the 7th month): Emperor Higashiyama abdicated; and his son received the succession (senso). Soon after, Emperor Nakamikado's role as monarch was confirmed by ceremonies (sokui). 16 January 1710 (Hōei 6, 17th day of the 12th month): Former-Emperor Higashiyama died. 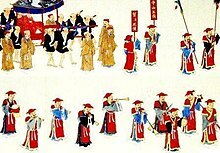 7 July 1710-22 March 1711 (Hōei 7, 11th day of the 6th month – Shōtoku 1, 4th day of the 2nd month): Diplomatic mission from Ryukyuan Kingdom was received in Edo. ↑ Nussbaum, Louis-Frédéric. (2005). "Hōei" Japan Encyclopedia, p. 338. ↑ Nussbaum, "Higashiyama Tennō," p. 310. ↑ Nussbaum, "Nakamikado Tennō," p. 690; Titsingh, Isaac. (1834). Annales des empereurs du japon, pp. 415-416. ↑ Shizuoka University website: 宝永四年（1707）噴火 (Japanese); retrieved 2011-12-12. ↑ 6.0 6.1 6.2 6.3 6.4 Titsingh, p. 416. ↑ Titsingh, p. 73; Varley, H. Paul. (1980). Jinnō Shōtōki, p. 44; a distinct act of senso is unrecognized prior to Emperor Tenji; and all sovereigns except Jitō, Yōzei, Go-Toba, and Fushimi have senso and sokui in the same year until the reign of Emperor Go-Murakami. Compare Imperial Household Agency (Kunaichō), Ceremony of Accession (Sokui-no-Rei); retrieved 2012-6-29. ↑ Titsingh, p. 416; Meyer, Eva-Maria. (1999). Japans Kaiserhof in der Edo-Zeit, p. 186; Kunaichō, 東山天皇 (113); retrieved 2012-5-27. ↑ National Archives of Japan: Ryūkyū Chuzano ryoshisha tojogyoretsu (Procession of Ryūkyū mission in Edo), 1710; retrieved 2011-12-12. This page was last changed on 29 November 2018, at 11:06.